It does not appear the the evil doers in this world seem to understand that Judgement Day arrived on October 29, 2010. Those that committed and continue to commit evil onto this world must now pay a price. This story, this Umbrellawalk, is just beginning and as I begin to tell the story I hope we will learn and believe that a great challenge is being put forth to man --- as man contemplates and dreams of traveling into the universe, can man rid itself of the great evils in our homeland -- before we begin to explore the universe?? On OCTOBER 31, 2010 I sent an invoice to the Attorney General of British Columbia, Canada, requesting that it be paid immediately. The invoice is for the payment of damages that I incurred from May 27, 2010 to October 15, 2010. I had informed the office and others on March 23, 2010 that I was not to be detained or arrested as I am a Freeman with no criminal record in their "commercial courts". I repeated and warned that I was a Freeman and that I was not be detained or imprisoned as I have done no harm. A letter was sent to many officials on March 23, 2010 declaring that I was a Freeman. This letter was also added to this website, and is still currently displayed on this website under the heading HARJGILL TRAVEL NOTICE - FREEMAN. However, on May 27, 2010 I was taken to Surrey Corrections Facility in Surrey, B.C., Canada. I was detained imprisoned, beaten and denied basic liberties until I was released on October 15, 2010. No allegations were certified as charges and I advised and showed them that all allegations were false and fictitious and were only created to harm or intimidate me. Unable to find a proper way to charge me with fictitious allegations finally I was released under ridiculous conditions, which I have chosen to ignore as the facility lacks jurrisdiction and its actions are improper. In addition as a Freeman they have no right to act against me or my person without my agreement due to the commercial nature of the judiciary in B.C.. This is an official invoice (Attachment A) demanding immediate payment for damaged incurred to the man, freeman, Harjit Gill. Freeman Harjit Gill is doing business as HARJIT GILL and therefore the invoice is from the person HARJIT GILL requesting immediate payment of the invoice attached. Original notice and warning was provided on March 23, 2010 via email with letter attached here. I will now wait for their replies if any, and then take further actions. KEEP IN TOUCH AS THE RABBIT HOLE GETS DEEPER AND DEEPER!!! Billy Joel, " INNOCENT MAN"
"the accused is an innocent man... I am an innocent man"
Bacon brothers' associate Albert Jackman of the Red Scorpion gang (right) is facing one count of assault in the incident. 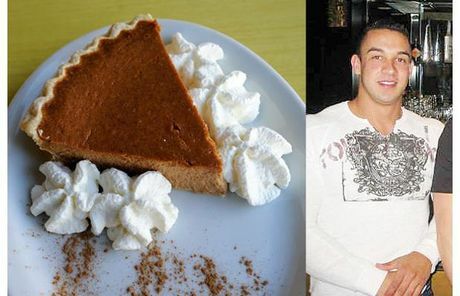 A Surrey pretrial prisoner who accused the Bacon brothers of hoarding Thanksgiving pumpkin pie received minor injuries in a beating Monday evening. A Bacon associate of the Red Scorpion gang is facing one count of assault in the incident. Albert Jackman, who is in jail awaiting trial for murder and aggravated assault, appeared in Surrey Provincial Court Wednesday on the new charge. He is being held in the same unit as Jamie Bacon, who is awaiting trial in the Surrey Six case, and Jarrod Bacon, who is facing a conspiracy to import cocaine charge. Surrey RCMP Const. Peter Neily confirmed Thursday that police were called to the pretrial jail about 7:30 p.m. Monday to investigate an assault. Neily said the RCMP gathered enough evidence at the scene to recommend that Crown lay an assault charge. He wouldn’t comment on what the evidence is, but the area where the dispute occurred has video surveillance, The Sun has confirmed. It was the second time in a month that Surrey pretrial staff had to call the RCMP in for assistance after an alleged fight involving gang members. The Bacons and Jackman allegedly brawled with members of the United Nations gang, including de facto leader Barzan Tilli-Choli and his associate Karwan Saed, in a meeting room near the jail gymnasium Sept. 10. Eight UN gangsters and associates are in jail awaiting trial for allegedly plotting to kill the Bacons and their Red Scorpion associates. The September incident was also captured on video, but no charges were laid. New Democratic Party public safety critic Mike Farnworth said Thursday that tensions are high in B.C. jails because of overcrowding and a prisoner population with an increasing number of gang members. “There is overcrowding in all facilities and that has been a problem for quite some time and we will see more incidents of violence within our facilities,” Farnworth said. He said BC Corrections should be releasing information about such incidents. “They are being ignored and swept under the carpet,” Farnworth said. BC Corrections spokeswoman Marnie Mayhew refused to confirm Thursday that a second fight in a month took place inside the pretrial centre. “For privacy reasons, I cannot comment on specific incidents or allegations within our correctional centres. Anytime a complaint or allegation is made, it is fully investigated,” she said. "We did not start the fire, it was always burning since the world's been turning"
Beatallica - "The Thing That Should Not Let It Be"